In her book Super Natural Cooking, Heidi Swanson includes a recipe for "Do-It-Yourself Power Bars." These snacks are made up of rolled oats, toasted walnuts, oat bran, crisp brown rice cereal, dried cranberries, crystallized ginger, and vanilla. On her website 101 Cookbooks, Heidi features another version (along with a snazzy video) called Big Sur Power Bars. These bars are made of pecans, almonds, coconut, oats, cereal, espresso powder, and vanilla. The ingredients in both versions are bound together with brown rice syrup. My version was a hodge-podge of stuff I already had in the pantry...rolled oats, walnuts, dried cranberries, coconut, and crystallized ginger. I found Brown Rice Crisps and brown rice syrup at Whole Foods. Heidi's recipes call for unsweetened cereal, but all I could find was lightly sweetened, so I omitted the 1/4 cup of sugar she calls for. I thought the syrup would be sweet enough, especially since the coconut was sweetened as well. Overall, my bars were tasty...but pretty soft. They held together but were kinda gooey, like soft rice crispy treats. I put the pan in the fridge, and they firmed up enough to cut and carry. Still, they tend to soften quickly if you don't eat them right away. I'm actually curious to know what the texture is supposed to be like. Anyway...they are GOOD...and a perfect take-along breakfast. I've been munching on the first batch all week and plan to make a second batch, tweaking the ingredients, this weekend. Here's what I made. I really suggest you try it! 1 tablespoon butter (or coconut oil). 1 1/4 cups rolled oats (I used the regular "Old Fashioned" Quaker Oats in the round container). 1 1/3 cups walnut chips, toasted. 2 cups brown rice crisps *(see note below). 3 tablespoons crystallized ginger, finely chopped. 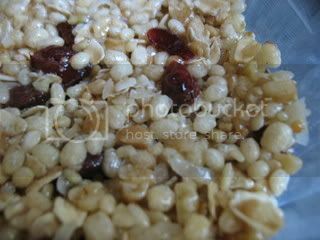 1 cup brown rice syrup. 1/2 teaspoon fine-grain sea salt. NOTE: As Heidi suggests, be sure to get cereal labeled crisp rather than puffed. If you can't find brown rice cereal, you can use regular Rice Crispies. Grease an 8x8 baking pan, or for thinner bars use a 9x13 pan, with butter. Toast the nuts and coconut in a non-stick skillet on the stovetop or on a baking sheet in a 350 degree oven for 7 minutes or so...until they are golden and fragrant. 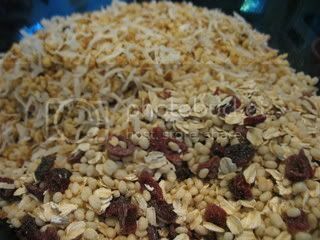 Mix the oats, nuts, coconut, cereal, cranberries, and ginger in a large bowl. Heat the rice syrup in a small saucepan over medium heat, stirring constantly as it comes to a boil and thickens just about...about 4 minutes. Ok, here's where I am a bit confused. Since I didn't add additional sugar to the syrup, I'm wondering if I didn't need to heat it. I'll have to ask Heidi about that! Pour the syrup over the cereal mixture and stir until it is evenly incorporated. 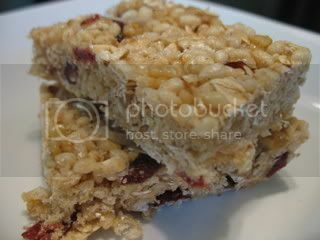 Spread into prepared pan, pressing top to even out mixture, and cool to room temperature before cutting into bars.